I've been a member of The Monthly Stitch since 2013 and in that time I've made a grand total of 5 posts, the last one over 2 years ago. I have been very slack so it's time for me to make an effort and join in again, just in time for Indie Pattern Month. The Dreamstress blog is a favourite of mine and I was interested when she launched a pattern line, Scroop Patterns, to see what the patterns would be. Did you know scroop is the technical name for the rustling sound that silk and rayon taffeta make?, you always learn something from Leimomi's posts. A few months ago she had a sale and I bought the Fantail Skirt pattern and it has sat on my computer ever since, so when Indie Pattern month rolled around at The Monthly Stitch I thought it was time to fire the printer and sewing machine up and get to work. Pattern: Scroop Patterns The modern Fantail Skirt. The description for this pattern says it is a classic 5-gore, A-line skirt with a fan of sewn pleats that release at mid-hip at center back. It features a waistband that sits at the natural waist, an invisible back zip, and hook or button fastenings at the waist. The skirt ends just below the knee, and is hemmed with a bias-tape hem. This is a digital download pattern. You get several documents in a zip file; detailed and streamlined instructions, printing instructions and the pattern pages in print-at-home A4 size or copy shop A0. As I don't know anywhere nearby to print the copy shop version I printed off the 28 A4 pages and stuck them together. The pattern matched up well and it didn't take long to stick it all together, but I would rather trace off a burda pattern any day. The fabric I used is Liberty Lantana (80% cotton, 20% wool) Ayse/Blue. It has a lovely feel to it and it was on special from The Fabric Store which makes it even better. Notions used: Thread, interfacing, 23cm invisible zip, 2.5cm wide bias binding for the hem - I used 2m, the pattern suggests 3.2m for all sizes, and 1 dome as I didn't have a skirt hook and I couldn't be bothered doing a buttonhole. I didn't make any alterations. My waist measurement was between size 40 and 42 so I went with size 40 and it fits fine. The sewing instructions are good, though I didn't follow them closely. I liked the method used to hem the skirt with bias binding and luckily I managed to find enough binding in my stash. I probably could shorten the skirt as I'm a few cms short of the 170cm height the pattern is designed for but I'm lazy so that probably won't happen. I only finished the skirt today so haven't worn it much yet but so far I like it and I might make another one. I like the look of the historical version where the pleats aren't sewn down so maybe I'll make that version. Pattern: Scroop Patterns The modern Fantail Skirt. It looks lovely! 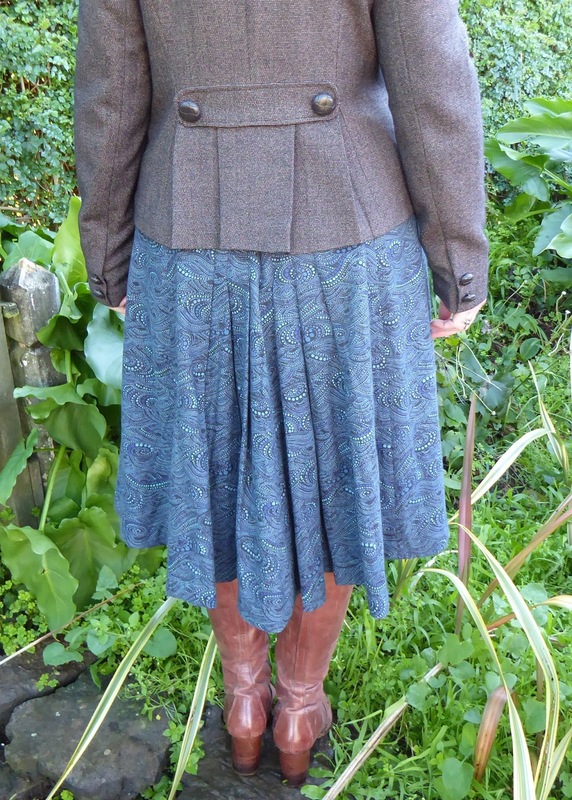 I've always been partial to extra fullness in the back of a skirt - so flattering!